As always, his name is Philip DeFranco, and you’ve just been phil’d in. Philip DeFranco has one of the most recognizable faces on YouTube, and he’s about to invade your TV. A charismatic and fast-paced vlogger, DeFranco is known for his celebrity gossip and pop culture commentary—a niche he helped pioneer on YouTube, with more than 900 videos posted since 2006. His main program, The Philip DeFranco Show, currently has 2.1 million subscribers, while SourceFed, the Google-funded show that he co-hosts with four others, is currently the eighth most-watched YouTube channel on Ad Age’s YouTube Original Content Tracker. Suffice to say, the handsome 26-year-old makes an ideal host for Discovery Channel’s annual Shark Week. Fittingly, DeFranco broke the news to his subscribers and fans in a candid YouTube video, posted July 23. While he worried that people would call him out for “selling out,” the feedback from his fans has been overwhelmingly supportive. To commemorate the 25th anniversary of Shark Week, Discovery is also doing something it’s never done before: giving control to the viewers. 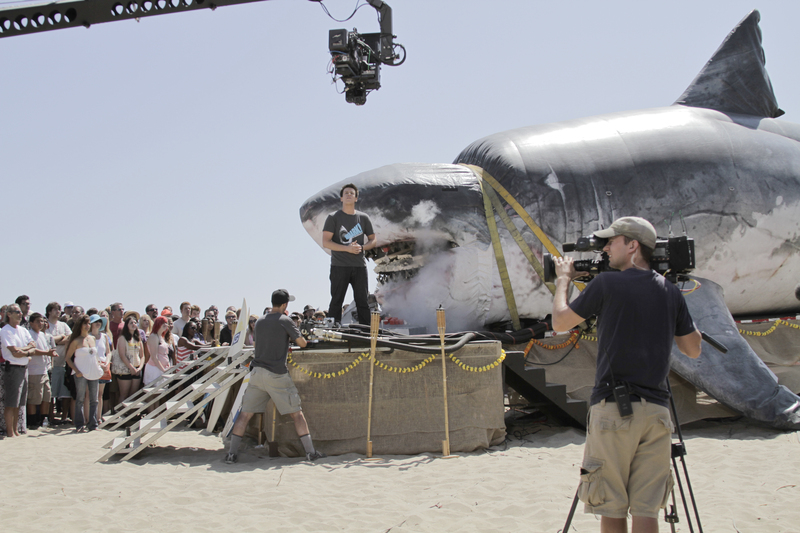 With DeFranco at the helm, viewers will be able to vote on which item that Sharkzilla, a 52-foot full-scale mechanical replica of the ancient Megalodon shark, will chomp with its razor-sharp teeth by the end of each night. At the end of Shark Week, DeFranco will helm Shark Week’s 25 Best Bites on Aug. 16 at 10pm ET and plans to live-tweet while the special airs. DeFranco didn’t take a break from filming The Philip DeFranco Show or SourceFed while filming promos and TV spots for Shark Week, however. Being on YouTube has made him really good at multitasking. While the door is clearly open for DeFranco to possibly transition into mainstream media, he doesn’t plan to jump the ship just yet—at least not after a week’s worth of shark footage.